Monera ( ) is a nuclear membrane), such as bacteria. 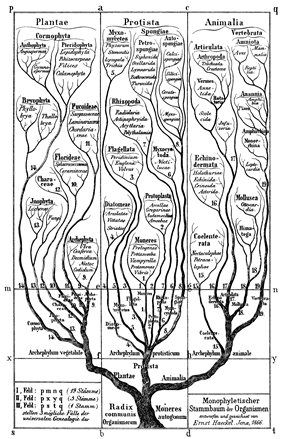 The taxon Monera was first proposed as a phylum by Ernst Haeckel in 1866. Subsequently, the phylum was elevated to the rank of kingdom in 1925 by Édouard Chatton. The last commonly accepted mega-classification with the taxon Monera was the five-kingdom classification system established by Robert Whittaker in 1969. Under the domains, Archaea and Bacteria (with Eukarya as the third domain). Furthermore the taxon Monera is paraphyletic (not all members descended from their most recent common ancestor), as Archaea and Eukarya are currently believed to be more closely related than either is to Bacteria. The term "moneran" is the informal name of members of this group and is still sometimes used (as is the term "prokaryote") to denote a member of either domain. Most bacteria were classified under Monera however, Cyanobacteria (still often called the blue-green algae) were initially classified under Plantae due to their ability to photosynthesize. Traditionally the natural world was classified as animal, vegetable, or mineral as in Antonie van Leeuwenhoek discovered bacteria and called them "animalcules," assigning them to the class Vermes of the Animalia. Due to the limited tools — the sole references for this group were shape, behaviour, and habitat — the description of genera and their classification was extremely limited, which was accentuated by the perceived lack of importance of the group. Ten years after Vibrio is the only bacterial genus explicitly assigned to the phylum, while others are mentioned indirectly, which led Copeland to speculate that Haeckel considered all bacteria to belong to the genus Vibrio, ignoring other bacterial genera. One notable exception were the members of the modern phylum Cyanobacteria, such as Nostoc, which were placed in the phylum Archephyta of Algae (vide infra: Blue-green algae). The Neolatin noun Monera and the German noun Moneren/Moneres are derived from the ancient Greek noun moneres (μονήρης) which Haeckel states to mean "simple", however it actually means "single, solitary". Haeckel also describes the protist genus Monas in the two pages about Monera in his 1866 book. The informal name of a member of the Monera was initially moneron, but later moneran was used. Bacterium — a genus of rod-shaped bacteria first described in 1828. Haeckel does not explicitly assign this genus to the Monera. Bacillus — a genus of spore-forming rod-shaped bacteria first described in 1835 Haeckel does not explicitly assign this genus to the Monera kingdom. Spirochaeta — thin spiral-shaped bacteria first described in 1835  Haeckel does not explicitly assign this genus to the Monera. Spirillum — spiral-shaped bacteria first described in 1832 Haeckel does not explicitly assign this genus to the Monera. etc. : Haeckel does provide a comprehensive list. Protomonas — identified to a synonym of Monas, a flagellated protozoan, and not a bacterium. The name was reused in 1984 for an unrelated genus of bacteria. Vampyrella — now classed as a eukaryote and not a bacterium. Like Protista, the Monera classification was not fully followed at first and several different ranks were used and located with animals, plants, protists or fungi. Furthermore, Häkel's classification lacked specificity and was not exhaustive — it in fact covers only a few pages—, consequently a lot of confusion arose even to the point that the Monera did not contain bacterial genera and others according to Huxley. They were first recognized as a kingdom by Enderlein in 1925 (Bakterien-Cyclogenie. de Gruyter, Berlin). The most popular scheme was created in 1859 by C. Von Nägeli who classified non-phototrophic Bacteria as the class Schizomycetes. Desmobacteria for the longer, filamentous rods and Spirobacteria for the spiral forms. Successively, Cohn created the Schizophyta of Plants which contained the non-photrophic bacteria in the family Schizomycetes and the phototrophic bacteria (blue green algae/Cyanobacteria) in the Schizophyceae This union of blue green algae and Bacteria was much later followed by Haeckel, who classified the two families in a revised phylum Monera in the Protista. Stanier and van Neil (1941, The main outlines of bacterial classification. J Bacteriol 42: 437- 466) recognized the Kingdom Monera with 2 phyla, Myxophyta and Schizomycetae, the latter comprising classes Eubacteriae (3 orders), Myxobacteriae (1 order), and Spirochetae (1 order); Bisset (1962, Bacteria, 2nd ed., Livingston, London) distinguished 1 class and 4 orders: Eubacteriales, Actinomycetales, Streptomycetales, and Flexibacteriales; Orla-Jensen (1909, Die Hauptlinien des naturalischen Bakteriensystems nebst einer Ubersicht der Garungsphenomene. Zentr. Bakt. Parasitenk., II, 22: 305-346) and Bergey et al (1925, Bergey's Manual of Determinative Bacteriology, Baltimore : Williams & Wilkins Co.) with many subsequent editions) also presented classifications. The term Monera became well established in the 20s and 30s when to rightfully increase the importance of the difference between species with a nucleus and without, In 1925 Édouard Chatton divided all living organisms into two empires Prokaryotes and Eukaryotes: the Kingdom Monera being the sole member of the Prokaryotes empire. In 1977, a archaea (initially called archaebacteria) are not significantly closer in relationship to the bacteria than they are to eukaryotes. The paper received front-page coverage in The New York Times, and great controversy initially. The conclusions have since become accepted, leading to replacement of the kingdom Monera with the two kingdoms Bacteria and Archaea. A minority of scientists, including Thomas Cavalier-Smith, continue to reject the widely accepted division between these two groups. Cavalier-Smith has published classifications in which the archaebacteria are part of a subkingdom of the Kingdom Bacteria. Although it was generally accepted that one could distinguish prokaryotes from eukaryotes on the basis of the presence of a  Other researchers, such as E. G. Pringsheim writing in 1949, suspected separate origins for bacteria and blue-green algae. In 1974, the influential Bergey's Manual published a new edition coining the term cyanobacteria to refer to what had been called blue-green algae, marking the acceptance of this group within the Monera. ^ a b c d e Ernst Heinrich Philipp August Haeckel (1867). Generelle Morphologie der Organismen. Reimer, Berlin. ^ van Leeuwenhoek A (1684). "An abstract of a letter from Mr. Anthony Leevvenhoek at Delft, dated Sep. 17, 1683, Containing Some Microscopical Observations, about Animals in the Scurf of the Teeth, the Substance Call'd Worms in the Nose, the Cuticula Consisting of Scales". Philosophical Transactions (1683–1775) 14 (155–166): 568–574. ^ van Leeuwenhoek A (1700). "Part of a Letter from Mr Antony van Leeuwenhoek, concerning the Worms in Sheeps Livers, Gnats, and Animalcula in the Excrements of Frogs". Philosophical Transactions (1684–1775) 22 (260–276): 509–518. ^ van Leeuwenhoek A (1702). "Part of a Letter from Mr Antony van Leeuwenhoek, F. R. S. concerning Green Weeds Growing in Water, and Some Animalcula Found about Them". Philosophical Transactions (1683–1775) 23 (277–288): 1304–11. ^ Don J. Brenner, Noel R. Krieg, James T. Staley (July 26, 2005) [1984(Williams & Wilkins)]. George M. Garrity, ed. Introductory Essays. Bergey's Manual of Systematic Bacteriology 2A (2nd ed.). New York: Springer. p. 304. ^ a b c d Copeland, H. (1938). "The kingdoms of organisms". Quarterly Review of Biology 13: 383–420. ^ Woese, C. R. (1987). "Bacterial evolution". Microbiological reviews 51 (2): 221–271. ^ μονήρης. Liddell, Henry George; Scott, Robert; A Greek–English Lexicon at the Perseus Project. ^ a b c Francis Polkinghorne Pascoe (1880). Zoological classification; a handy book of reference with tables of the subkingdoms, classes, orders, etc., of the animal kingdom, their characters and lists of the families and principal genera. ^ PACINI (F.): Osservazione microscopiche e deduzioni patologiche sul cholera asiatico. Gazette Medicale de Italiana Toscano Firenze, 1854, 6, 405-412. ^ EHRENBERG (C.G. ): Dritter Beitrag zur Erkenntniss grosser Organisation in der Richtung des kleinsten Raumes. Physikalische Abhandlungen der Koeniglichen Akademie der Wissenschaften zu Berlin aus den Jahren 1833-1835, 1835, pp. 143-336. ^ EHRENBERG (C.G. ): Dritter Beitrag zur Erkenntniss grosser Organisation in der Richtung des kleinsten Raumes. Abhandlungen der Preussischen Akademie der Wissenschaften (Berlin) aus den Jahre 1833-1835, pp. 143-336. ^ EHRENBERG (C.G. ): Beiträge zur Kenntnis der Organization der Infusorien und ihrer geographischen Verbreitung besonders in Sibirien. Abhandlungen der Koniglichen Akademie der Wissenschaften zu Berlin, 1832, 1830, 1-88. ^ C. Von Nägeli (1857). R. Caspary, ed. "Bericht über die Verhandlungen der 33. Versammlung deutscher Naturforscher und Aerzte, gehalten in Bonn von 18 bis 24 September 1857" [Report on the negotiations on 33 Meeting of German Natural Scientists and Physicians, held in Bonn, 18 to 24 September 1857]. Botanische Zeitung 15: 749–776. ^ Migula W (1894). "Über ein neues System der Bakterien". Arb Bakteriol Inst Karlsruhe 1: 235–328. ^ CHESTER F. D. (1897). "Classification of the Schizomycetes". Annual Report Delaware College Agricultural Experiment Station 9: 62. ^ Buchanan R E (Nov 1916). "Studies in the Nomenclature and Classification of Bacteria: The Problem of Bacterial Nomenclature". J Bacteriol 1 (6): 591–6. ^ Ferdinand Cohn (1872). "Untersuchungen uber Bakterien". Beiträge zur Biologie der Pflanzen 1 (1). pp. 127–224. ^ Ferdinand Cohn (1875). "Untersuchungen uber Bakterien". Beiträge zur Biologie der Pflanzen 1 (3). pp. 141–208. ^ Ernst Haeckel. The Wonders of Life. Translated by Joseph McCabe. New York and London. I904. ^ a b Chatton, É. (1925). "Pansporella perplexa. Réflexions sur la biologie et la phylogénie des protozoaires". Annales des Sciences Naturelles - Zoologie et Biologie Animale. 10-VII: 1–84. ^ a b c R H Whittaker (1969). "New concepts of kingdoms or organisms. Evolutionary relations are better represented by new classifications than by the traditional two kingdoms". ^ a b c d Jan Sapp (June 2005). "The Prokaryote-Eukaryote Dichotomy: Meanings and Mythology". Microbiology and Molecular Biology Reviews 69 (2): 292–305. ^ GIBBONS (N.E.) and MURRAY (R.G.E. ): Proposals concerning the higher taxa of bacteria. International Journal of Systematic Bacteriology, 1978, 28, 1-6. ^ Lyons, Richard D. (Nov 3, 1977). "Scientists Discover a Form of Life That Predates Higher Organisms". The New York Times. pp. A1, A20. ^ Holland L. (22 May 1990). "Woese,Carl in the forefront of bacterial evolution revolution". scientist 4 (10). ^ a b Cavalier-Smith, T. (1998). "A revised six-kingdom system of life". Biological Reviews 73 (03): 203–66. ^ Linnaeus, C. (1735). Systemae Naturae, sive regna tria naturae, systematics proposita per classes, ordines, genera & species. ^ Woese, C.; Kandler, O.; Wheelis, M. (1990). "Towards a natural system of organisms: proposal for the domains Archaea, Bacteria, and Eucarya.". Proceedings of the National Academy of Sciences of the United States of America 87 (12): 4576–9. Woese CR (June 1987). "Bacterial evolution". Microbiol. Rev. 51 (2): 221–71. Woese reviewed the historical steps leading to the use of the term "Monera" and its later abandonment.